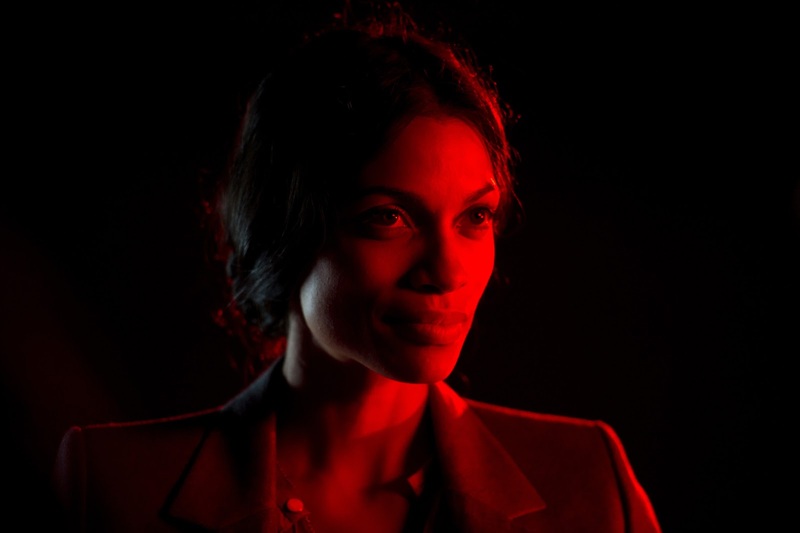 In the psychological caper “Trance” directed by Academy Award winner Danny Boyle, Rosario Dawson delves deep into her role as Elizabeth Lamb, a hypnotherapist that she says has broken every mold of a character she’s ever played. Stolen memories will resurface in “Trance.” Simon (James McAvoy), a fine art auctioneer, teams up with a criminal gang to steal a Goya painting worth millions of dollars. After suffering a blow to the head during the heist, he awakens to discover he has no memory of where he hid the painting. When physical threats and torture fail to produce answers, the gang’s leader Franck (Vincent Cassel) hires hypnotherapist Elizabeth Lamb (Rosario Dawson) to reach into the darkest recesses of Simon’s psyche. As Elizabeth begins to unravel Simon’s broken subconscious, the line between truth, suggestion, and deceit begin to blur. Boyle brings a fresh take on the iconic femme fatale in the character of Dawson as Elizabeth Lamb, the beautiful hypnotherapist who proves to be every bit the equal of the men playing power games around her. The most alluring leg of the movie’s triangle belongs to Lamb which Dawson molded to become a very modern re-model of the classic femme fatale. At first she seems like she might be just an eye-catching, over-confident pawn in an all-male game, but Elizabeth’s true power begins to emerge as the story unravels. Known for her previous notable works in “Sin City,” “Rent,” “Seven Pounds” and “He Got Game,” Dawson has worked with many of the world’s leading directors, from Spike Lee to Quentin Tarantino, Chris Columbus and the late Tony Scott – but this role is totally different from her previous ones. “I’ve never played anyone even remotely like her,” says Dawson of Elizabeth Lamb. “Elizabeth is totally different because she’s hiding everything. You only get hints of her emotion through her doing things with her hair to show her restraint but when she lets her hair down, she really lets her hair down. Then, you get to see a different side of her. It’s subtle; it’s completely unspoken. And she’s a wonderful presence to have between these two guys,” Dawson explains. “Trance” opens May 1 in cinemas nationwide from 20th Century Fox to be distributed by Warner Bros.